I had said a couple of posts ago how frustrated I was that I couldn't get my son to go to sleep by himself at night. We would have to lay down with him until he was asleep and then we would fall asleep and it would mess up our schedule. Well, I finally did it. He goes to bed all by himself now. I tell you the first night was really hard having him crying but really...he cried for an hour the first night and then the next night 15 minutes and then the next night not at all. I would stand by the door so he knew I was there and he could see me. The next week I stood on the other side of the door where he knew I was there but couldn't see me. This week I tuck him in and say I'm in the living room so you know I am just down the hall and he is fine with it. I can't believe that it actually worked! NEXT STEP: Toilet training at night. So, how are you? I'm just fine. I think someone hates me...a lot! I have been hacked at my other site Taylor's Entertainment News for the third time! Yes, you heard me. Every time I have had to rebuild it again. This time I have had enough. I am moving on. I have a new website and a new host. I will get them to leave me alone somehow right? I don't want them to win and for me to give up! When your site is hacked it's like losing everything you have worked on just gone. Like someone breaking into your house and taking that favorite ring of yours. You feel like someone took your heart. I feel so horrible that I am attached to something like that but what can I do? I post on that blog at least three times a day every day. It's my heart and soul. But I will rebuild again. I have had some amazing support. I know people really care about what has happened. So, the lesson is to never give up. We can all do what we have set to do... :) Later on, I'll tell you all about the new site. They seem to have different ones all the time on there...yesterday Woman's Day was on there...today it's Family Fun and Bassmasters. 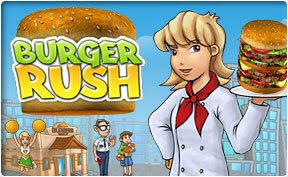 Do you like Burger Rush? Now you can have it FREE! Seriously... here is the full version download link! Enjoy it as much as I did!